Afghan Hounds are spectacular beauties and a sight to behold. They are tall and lean, and the long top knot as a distinctive feature. Its coat is long and fine in texture, and all four feet and legs are aligned perfectly with the body. Because of their long, shiny coat, Afghan Hounds are highly desirable show dogs and pets. 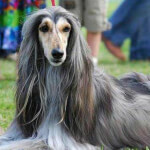 Though they have strong reasoning skills and are very independent, Afghan Hounds have slow obedience and intelligence. Their independence can sometimes lead to shyness, making them difficult to live with. This breed has an aristocratic personality and expects to be catered to whenever they wish. They are agile runners and jumpers, and they do best with spacious houses that have acreage. 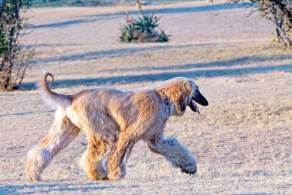 Those interested in owning an Afghan Hound should be ready very patient and have an excellent understanding of what it means to be a pack leader. 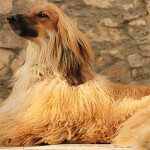 Below are details and specs for the Afghan Hound dog breed. Afghan Hounds are large-sized dogs, with a height that ranges between 24 to 29 inches, and a weight that ranges between 45 to 60 pounds. 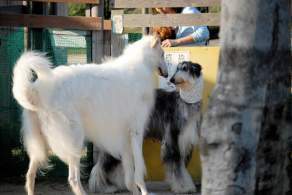 They are tall dogs with a lean weight, and they have a lifespan of 11 to 13 years (similar to other dogs of similar size). Afghan Hounds are aloof, clownish, happy, dignified and independent, with excellent reasoning skills. They are also courageous, dignified, spirited, smart, affectionate, and sensitive. Though they may have faithful and endearing personalities, grooming, running, high prey drive, and training may prove to be challenges. Their independence can lead to extreme shyness, making them somewhat difficult to live with. It is important to train and socialize Afghan Hounds, as they have natural prey instincts that may not be suitable for smaller animals. Well-socialized Afghan Hounds get along great with kids and families, so long as the humans understand how to become a gentle pack leader. They should never be left unsupervised, as they ca become bored very easily. Afghan Hounds are high maintenance dogs. They require many walks and exercise to exhaust their high energy. They are known to be agile runners and jumpers, so exercise is needed to keep them happy and healthy. Leaving them without any form of exercise can lead them to develop destructive behaviors like excessive chewing. Training Afghan Hounds is notoriously difficult, as they do not care to please others or listen to others do to their high independence. They would rather be catered to, like the true aristocrats that they are. Training requires plenty of time and effort. They shed year round, and frequent brushing and grooming is needed to maintain their upkeep. They are naturally healthy dogs. The Afghan Hound is the oldest dog breeds in existence. 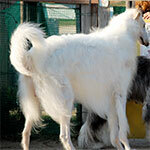 They descended from Sighthounds, which are among the oldest recognizable types dogs. Little is known for certain about the origin of the Afghan Hound. One theory states that the breed originated in the Middle East and found its way to Afghanistan via Persia. Another theory states that they originated from Sinai, and that they were written in Egyptian papyruses. 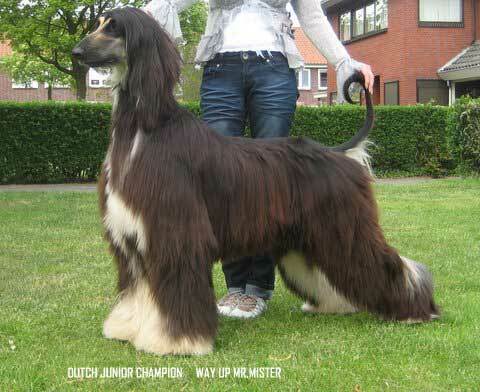 In Afghanistan, Afghan hounds developed their long coats as protection from high altitudes. Their main use was for hunting. With their sight, they would track game and hold the animal until the hunting party could catch up. Today's modern purebred breed of the Afghan Hound descends from dogs brought in the 1920s to Great Britain. They are a blending of types and varieties of long-haired Sight hounds from across Afghanistan and it's surrounding areas. At least 13 types are recognized in Afghanistan. Afghan Hounds are spectacular beauties and a sight to behold. They are tall and lean, and the long top knot as a distinctive feature. Its coat is long and fine in texture, and all four feet and legs are aligned perfectly with the body. 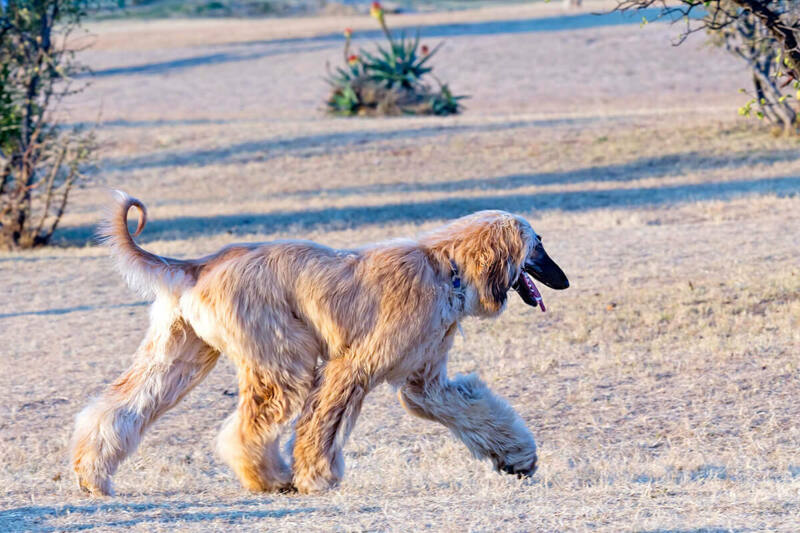 Afghan Hounds have a straight front, and a proudly - carried head. They have a silky top knot with a peculiar coat pattern. With prominent hip bones, Afghan Hounds have large feet and bend in stifle. Its head has a Roman appearance, with ears that are long and level with the corners of its Almond - shaped and almost triangular eyes. Their ears can reach to the end of its nose, and are covered with its long, silky hair. They have a strong and arched neck and a strong and powerful tail that is not too high on the body and that usually has a curve or ring at the end. Afghan Hounds can be one of the following colors: black, black and silver, black and tan, blue, blue and cream, cream, red, silver, and white. Their markings include: black mask, brindle, brindle black mask, brindle domino, and domino. Dark-colored Afghan Hounds are just as common as light-colored Afghan Hounds. Afghan Hounds are large-sized dogs. Their height ranges between 24 to 30 inches, and their weight also ranges from 45 - 60 pounds. Their life expectancy averages between 11 to 13 years. 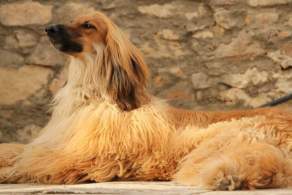 The ancient Afghan Hound is one of a handful of "basal" dog breeds, meaning this breed (along with a dozen or so others) is the "basis" from which all other breeds have developed. As such, the Afghan Hound has many different varieties, particularly in different regions of its native Afghanistan. Though consistent Afghan Hound breed standards exist in the AKC and other clubs, those guidelines are for show dogs; otherwise, numerous variations in size, coat length and color, and temperament are possible with the breed. Coat is one trait that varies a lot among these dogs. 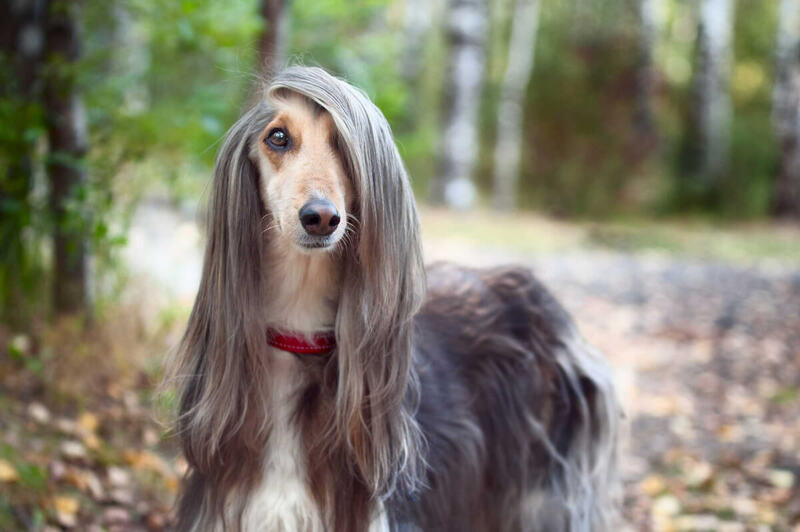 Though its long, silky coat is a cherished feature in the typical Afghan Hound, short hair is indeed possible with the breed, especially in warmer regions. So while the long-haired Afghan Hound is most common, medium- or short-length coats are seen as well. Coat color, too, has some variety. 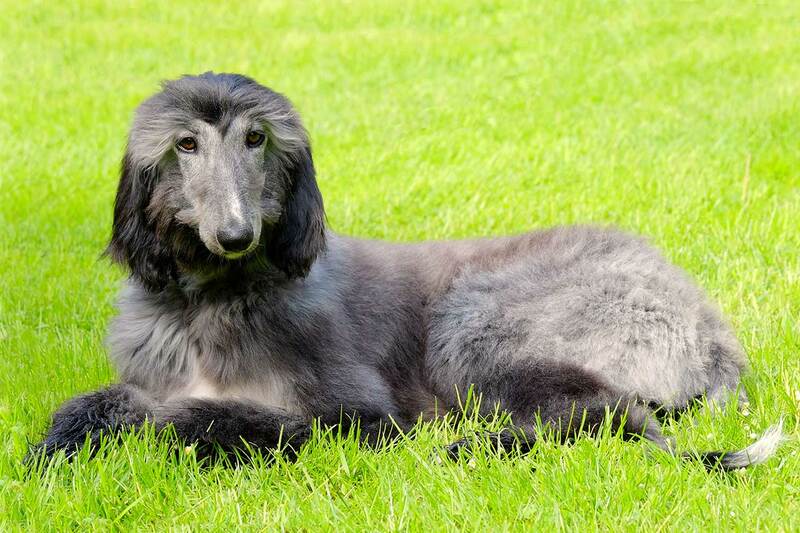 Solid black, silver, cream, or blue (or a combination of two of those colors) is often seen--but the breed can have markings as well, one of which is named specifically for this breed: a "Domino" Afghan Hound is a popular yet rare coat pattern. "Domino," known as sable or grizzle in other breeds, is a distinctive, multi-colored pattern that in this breed is named after Tanjores Domino, a noted show dog from the 1950s with that coat type. Size, though, doesn't vary too much within the breed. The breed standard calls for an average height of 26 inches and weight of 55 pounds--and while some varieties may be a bit larger or smaller, the differences aren't great. 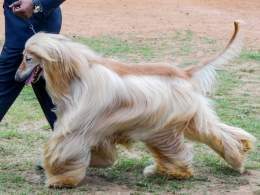 Savvy breeders, meanwhile, will discreetly crossbreed the Afghan Hound with small or even toy long-haired breeds (like the Havanese or Yorkshire Terrier, for example) and call it a "Miniature Afghan Hound." Afghan Hounds are special dogs for special people. They are aloof, clownish, happy, dignified and independent, with excellent reasoning skills. Afghan Hounds are also described as courageous, dignified, spirited, smart, affectionate, and sensitive. Though they may have faithful and endearing personalities, challenges with grooming, running, high prey drive, and training may arise. Afghan Hounds are playful as puppies, but they can become very independent as they mature. This makes then notoriously difficult to train. Because of their independence, they can be very stubborn and will passively resist to any firm of command or training. Afghan Hounds require extensive training, and patience, treats, and persistence is necessary. They are independent thinkers that do not care about pleasing others or being told what to do; instead, Afghan Hounds expect others to treat them like the king and queen they are in the dog world. They are often referred to the Aristocrat of the dog world. Afghan Hounds are standoffish by nature. They have emotional sensitivity to stress and abrupt changes in schedule. It is important that they be surrounded by peace and tranquility to avoid any emotional issues. They should not be left unsupervised for long periods of time. They require a lot of personal attention and running exercise, otherwise they can easily become destructive (especially with chewing). Well-socialized Afghan Hounds are overall great with children, but should never be left unsupervised with children due to their large size and high amounts of energy. Afghan Hounds do better with older, more mature children who have a good understanding of what it means to be a gentle pack leader. It is important that they are socially trained at an early age so that they are more comfortable around others. Afghan Hounds have a strong prey drive and because of this, they may not get along well with small animals. They are likely to chase after other animals. If Afghan Hounds are socialized to live with other dogs, they can coexist peacefully. It is highly recommended that no cats or rabbits be living in the same household. 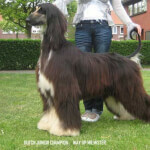 Afghan Hounds are very independent dogs and this may lead to extreme shyness, making them difficult to get along with. Because of their aristocratic personalities, they do not care to please others and may not even pay attention to strangers unless the strangers are directly catering to them. If Afghan Hounds are socialized to live human beings at an early age, they should be able to get along with other strangers fine. 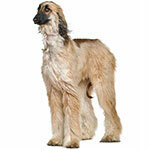 Below are pictures of the Afghan Hound dog breed. Very high maintenance is needed when raising Afghan Hounds. Because they shed their long coat all year round, frequent brushing, and trimming is required. Lack of grooming can lead to problems. Also, heavy exercise is needed. Afghan Hounds love running around, and they need plenty of space to run and jump. Other times, Afghan Hounds seek personal attention and if not given to, may become destructive. It is not recommended that Afghan Hounds be left unsupervised. Afghan Hounds require a considerable amount of care and grooming, and frequent baths are necessary. A great deal of time and effort is needed to accomplish this. Afghan Hounds have a coat that is similar to human hair. Their coat tangles very easily, and brushing is required along with trimming and stripping many times a year. 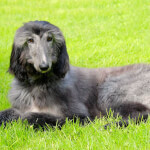 Cleanliness in the ears is a must - because they have pendant ears, it is easy for Afghan Hounds to catch infections if they are not cleaned properly. It is highly recommended that the owner hire a professional groomer, especially if the Afghan hound is to participate in competitions. Afghan Hounds are very athletic, agile, and quick. They are the most agile of all breeds and are considered one of the best jumpers. They love running and galloping through yards and they require a great deal of exercise. They need plenty of time during the day to run and jump, partaking in activities that help them exert their high energy efficiently. Because of their long coat, Afghan Hounds should never be exercised in warm to hot weather. Afghan Hounds do best with acreage. Though they can adapt sleeping both inside and outside, sleeping indoors is preferred. 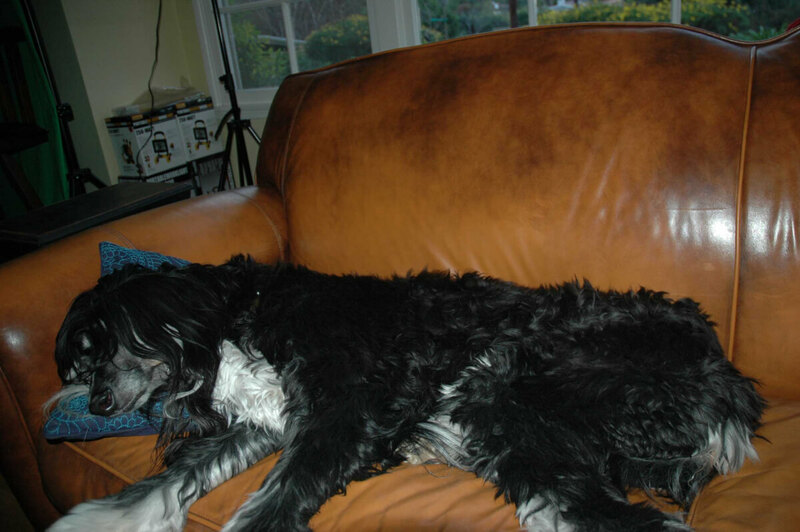 While they love to exercise, Afghan Hounds also like to lounge around and be catered to. 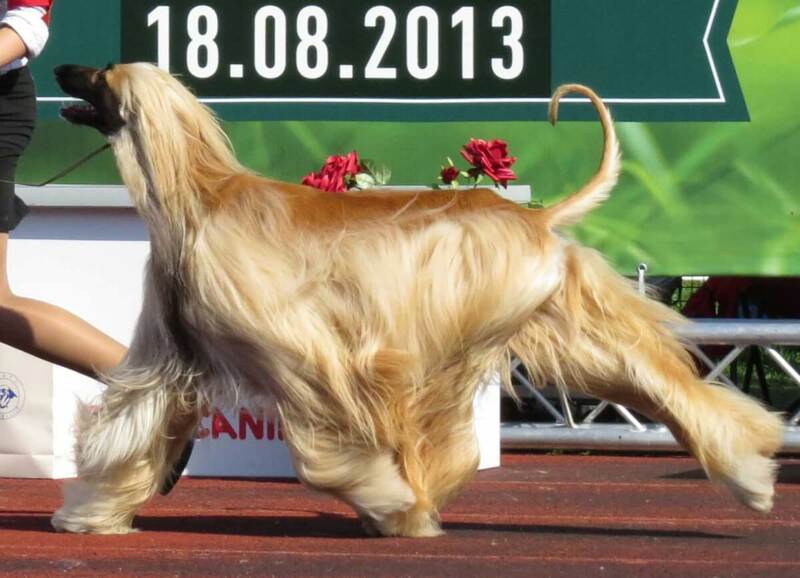 Because Afghan Hounds enjoy running through yards, they should not be kept confined in an apartment. They should never be left unsupervised for long periods of time because they become bored easily. Boredom can lead to destructive habits like excessive chewing. Afghan Hounds are comfortable staying outside, but it is recommended that they are protected by high fences, as they are known to roam around and not return due to their high independency. 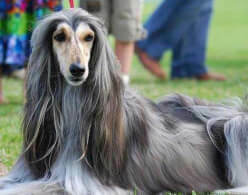 Afghan Hounds have high stress sensitivity, so it is important that they stay in a home that is peaceful and harmonious. It is also not recommended that other small animals live in the same household (unless well-trained socially), because of their instinctive prey and chasing habits. 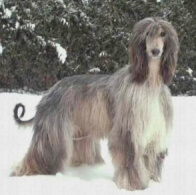 The coast of Afghan Hounds initially served as protection from harsh climate in mountainous regions and because of this, they are comfortable in cold weather but do not do as well in warmer to high temperatures. Afghan Hounds should never do any sort of activity or exercise in warmer temperatures. This breed has its own Barbie doll. In 1979, Mattel introduced Beauty, the Barbie Afghan Hound dog. A white Afghan with black markings, Beauty came packaged with accessories including its own bed and food bowl. Certain Afghan Hound breeders have produced numerous champion dog lines. Tahkira Afghan Hounds, Shimalma Afghan Hounds, Bondor Afghan Hounds, and Boanne Afghan Hounds, among others, have bred multiple generations of prize-winning dogs. Many noted celebrities have owned Afghan Hounds. Zeppo Marx of the Marx Brothers was one of the first American owners of this breed; Spanish artist Pablo Picasso, who owned several, featured an Afghan in his painting "Femme au chien," which sold for $11 million at a 2012 auction. Part of the breed's visual appeal is its unique physical features. 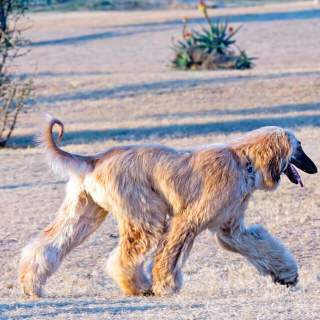 Long, flowing coat aside, the Afghan Hound has unusually high hip bones, a natural top-knot on its head, and extremely large feet, all of which contribute to the breed's regal appearance. Afghan Hounds have an average lifespan of 11 to 13 years, and have sensitivity to anesthesia. Their top main causes of death are cancer, old age and cardiac problems. 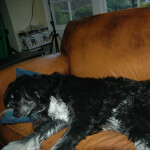 Their health issues include allergies, cancer and hip dysplasia. Overweight can lead to strains on their hip bones. Afghan Hounds also have very low levels of body fat. Importantly, they can develop a rare condition called Chylothorax, in which escaped lymphatic fluid accumulates in the chest cavity causing cold like symptoms and difficulty breathing.